The collision last year killed seven sailors. A junior Navy officer pleaded guilty on Tuesday to her role in last year's deadly collision involving the destroyer USS Fitzgerald off the coast of Japan that killed seven sailors. Lt. j.g. Sarah Coppock's guilty plea came on the first day of Navy court proceedings for four of the destroyer's officers, including the ship's commanding officer. About 1:30 a.m. on June 17, 2017, the USS Fitzgerald collided with the container ship MCX Crystal as both ships transited through the busy shipping lanes outside of Tokyo Bay. At the time of the collision, Coppock was serving as the Officer of the Deck, the officer overseeing the bridge team that was steering the ship. At Tuesday's hearing, Coppock entered a guilty plea to a charge of “dereliction in the performance of duties through neglect contributing to the deaths” of the seven sailors. Coppock acknowledged that, in violation of the commanding officer's standing orders and navigation rules, she had failed to communicate with the ship's Combat Information Center, did not report ship contacts with the commanding officer and did not alert the ship's crew of an imminent collision. During questioning from Capt. Charles Purnell, the presiding judge at Tuesday's special court-martial, Coppock admitted that in violation of Cmdr. Bryce Benson's order, she had not contacted him whenever a ship sailed within 6,000 yards of the destroyer. That happened 13 times during her four-hour watch the night of the collision, with some ships coming as close as 650 yards of the destroyer. (U.S. Navy via Getty Images) The USS Fitzgerald sits in Dry Dock 4 at Fleet Activities Yokosuka, Japan to continue repairs and assess damage sustained from its June 17, 2017 collision with a merchant vessel. Coppock acknowledged she had "low confidence" in some of the sailors standing watch in the ship's Combat Information Center (CIC), one reason why she never checked with the sailors manning the sophisticated radars in the CIC who could have also checked the distances of passing commercial ships. In sentencing arguments Lt. Cmdr. Paul Hochmuth noted that Coppock was not solely to blame for the collision and has taken responsibility for her actions. But he cited her "loss of complete situational awareness" of the destroyer's passage through the busy shipping lane. "She chose to be blind and never asked for help from the CIC," said Hochmuth. Coppock's attorney, Lt. Ryan Mooney, noted that she had not shied away from her role in the collision, but pointed to staffing shortfalls aboard the Fitzgerald and a lack of training among officers as indicators of broader issues aboard the ship and the U.S.-based fleet in Japan. Under the guilty plea agreement, Coppock was sentenced to receive a letter of reprimand and three months of half-pay. But because she had earlier received a similar non-judicial punishment, the new sentence only added an additional month of half-pay for the junior officer. 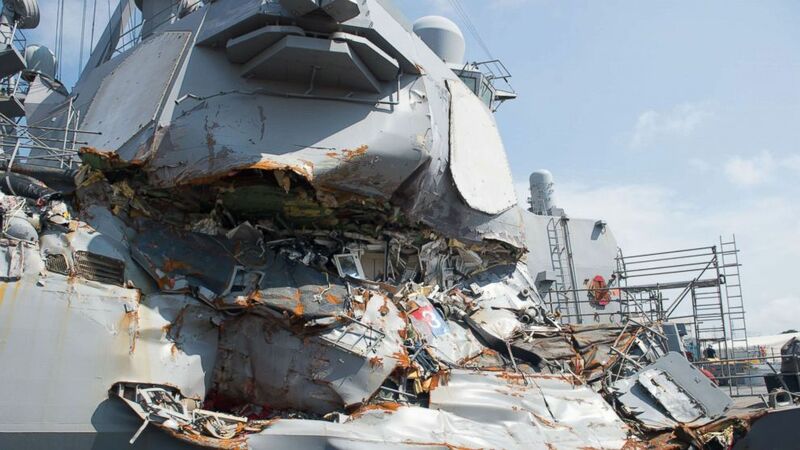 The Navy's comprehensive investigation into the collision found that it was avoidable and was the result of a series of basic failures by the ship's crew and officers. After the investigation, the Navy filed criminal charges against four of the ship's officers, including Benson. Preliminary court hearings for two junior officers will be held at the Washington Navy Yard on Wednesday, Benson's court hearing is slated for May 21. The seven sailors killed in the collision were Gunner's Mate Seaman Dakota Kyle Rigsby, 19, from Palmyra, Va.;Yeoman 3rd Class Shingo Alexander Douglass, 25, from San Diego, Calif.; Sonar Technician 3rd Class Ngoc T Truong Huynh, 25, from Oakville, Conn.; Gunner's Mate 2nd Class Noe Hernandez, 26, from Weslaco, Texas; Fire Controlman 2nd Class Carlosvictor Ganzon Sibayan, 23, from Chula Vista, Calif.; Personnel Specialist 1st Class Xavier Alec Martin, 24, from Halethorpe, Md. and Fire Controlman 1st Class Gary Leo Rehm Jr., 37, from Elyria, Ohio. As part of the sentencing hearing that followed Coppock's guilty plea family members of some of the fallen sailors gave emotional statements about the emotional trauma they have lived through since the sudden loss of their loved ones. "I am perpetually sad and I cry all the time," said Terri Rigsby, Dakota Rigsby's stepmother. "This collision should have never occurred." "I blame the Navy for the loss of my son," she said reading from a statement written by her husband Lloyd who also wrote he could not forgive the Navy for his son's death. Xavier Alec Martin's father Darrold Martin told the court: "It's not right for a parent to bury a child." Speaking through tears, Dora Hernandez, described how her three-year-old son will not have personal memories of his father, Noe Hernandez. In emotional testimony of her own, Coppock expressed her remorse to the family members in the courtroom and said: "All I can do now is take responsibility." As a memorial to those that perished in the collision, Coppock has a tattoo on her left wrist that includes the latitude and longitude of the location of the collision, as well as seven green clovers representing the seven fallen sailors and the ship's motto "Protect Your People".